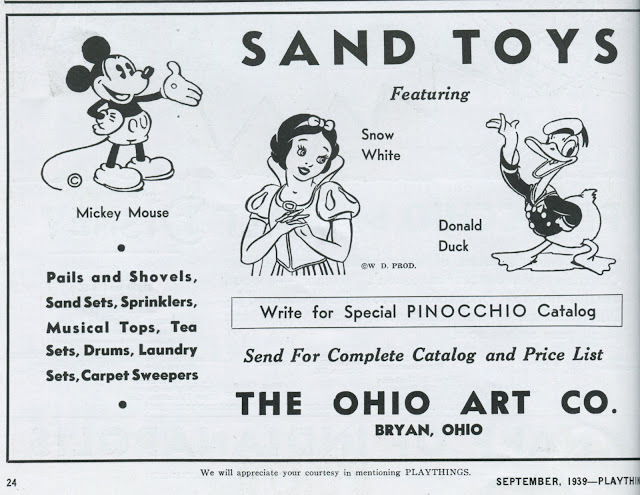 A trip to the beach in 1938 was made all the more fun with the introduction of Snow White sand toys from the Ohio Art Company. 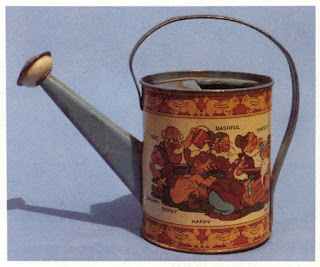 Tin pails, shovels, and sprinkling cans were produced in a wide assortment of sizes and lithographed designs. 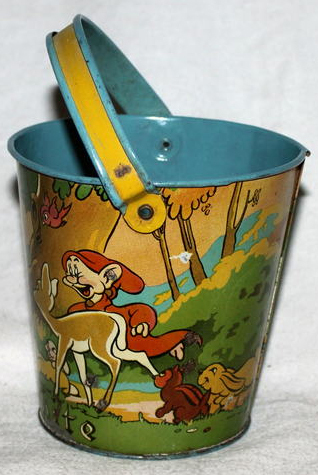 Lipped-base pail courtesy of the Michael Filippello Collection. Standing about the same height and incorporating the same artwork, this second pail differs from the one above only in not having a lipped-base. The lithograph encircling this next pail has the princess sitting at the forest edge with the dwarfs approaching from both sides. 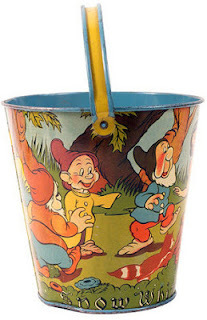 The "Snow White" font at bottom is small. 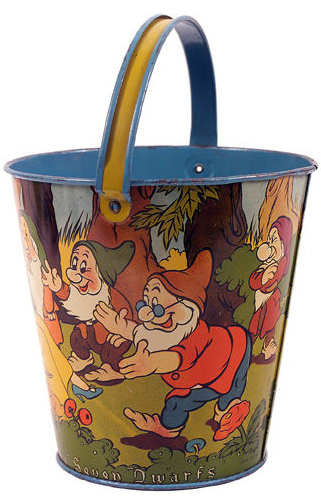 The pail has a normal base and measures approximately 4.25" in height (not including the rounded handle). 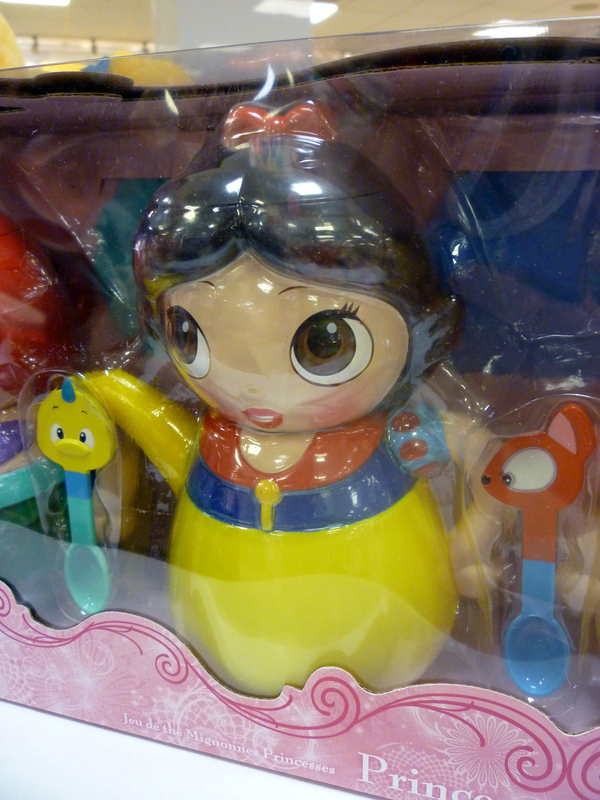 Even toys that look the same at first glance, may have interesting variations. 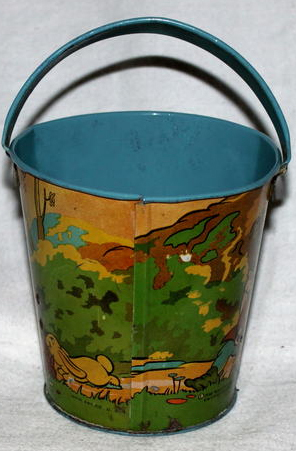 A similar, but slightly larger pail shares the same artwork. 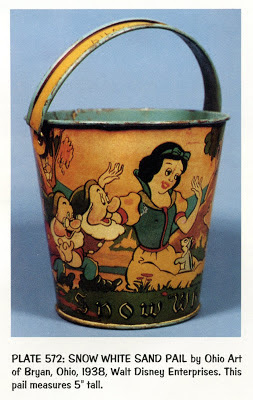 Yet, the "Snow White" text at base is much more prominent. In addition, Grumpy was hidden under the handle attachment in the above example, but he's quite visible here. Also, the handle on this one is flat, not rounded. The smaller and larger pails shown side-by-side. 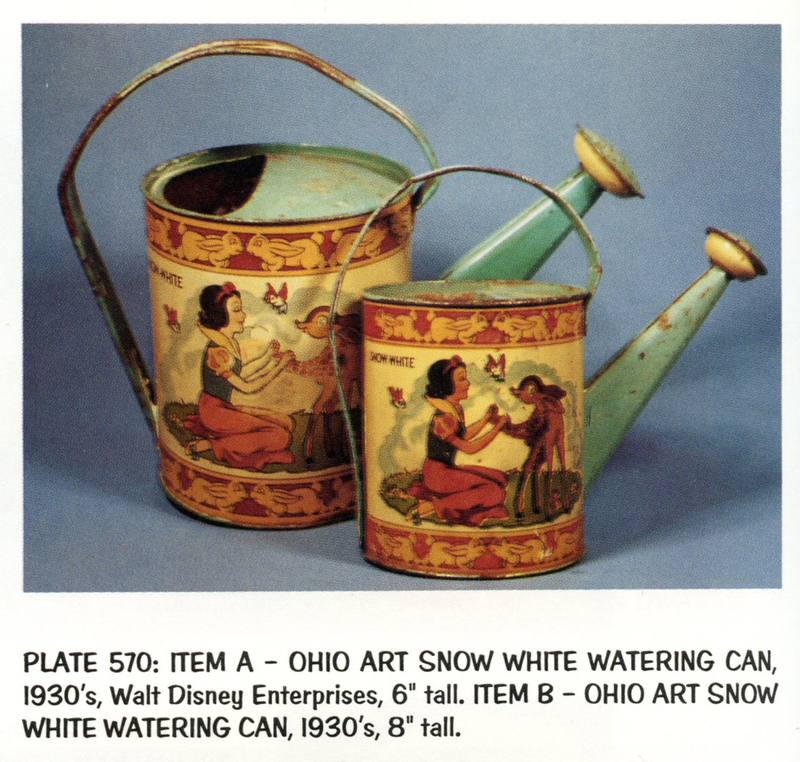 Both are imprinted with "Ohio Art Co." and "©1938 Walt Disney Enterprises." 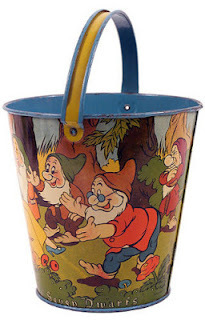 Image courtesy of Brian at Disneyana Vintage Collectibles 4U. 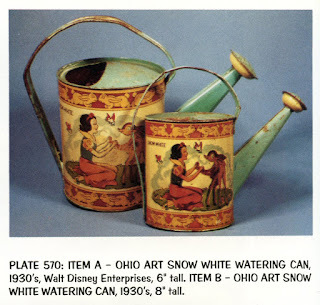 A couple pails were listed in The Collector's Encyclopedia of Disneyana by Michael Stern and David Longest, p.142-143 (Collector Books, 1992). 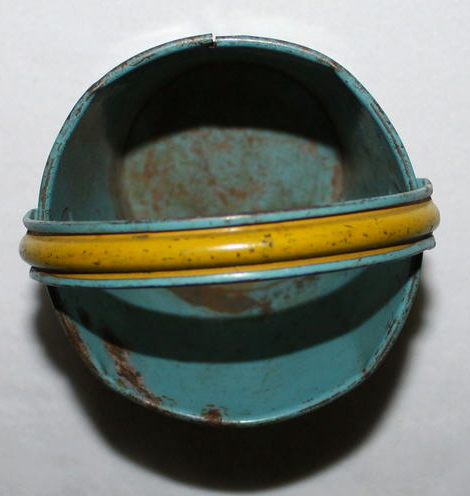 The smaller of the two is identical to one above. The second is a 10" version with artwork of Snow and the dwarfs running through the forest. The artwork of Snow White on the tree stump is pictured in a 1938 wholesale catalog from the N. Shure Company of Chicago (page 1024). 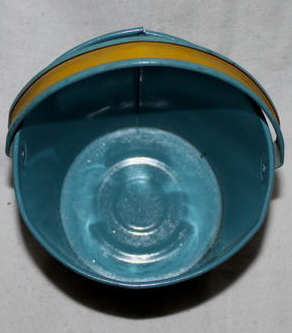 Three different sized tin pails are offered: 3.25", 5.25", and 6.75". 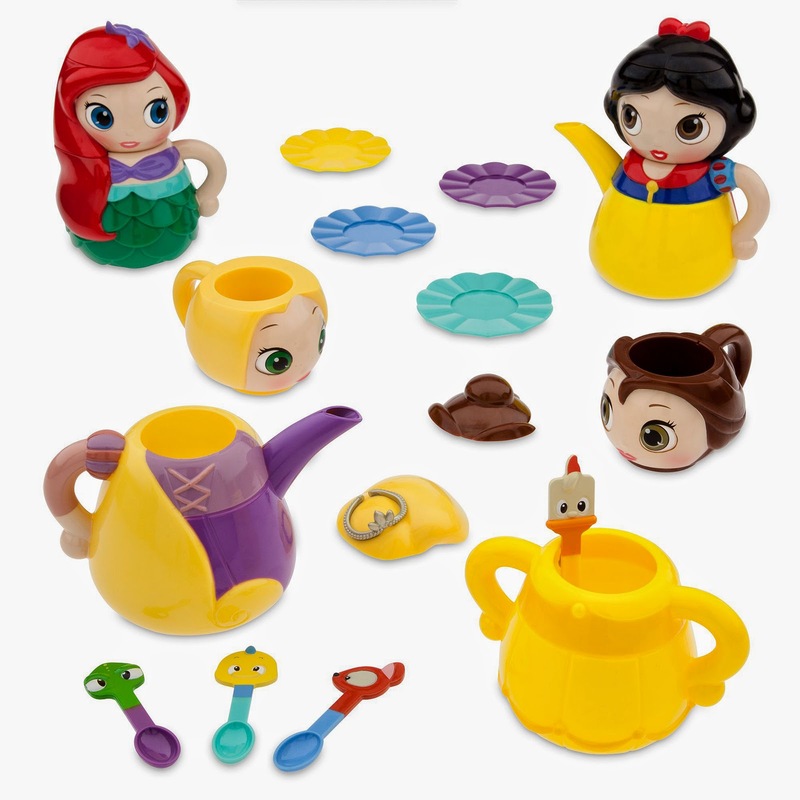 Each comes complete with a sand shovel. 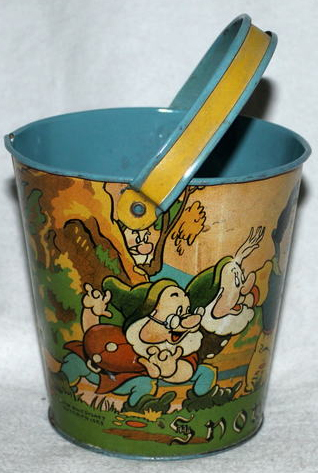 The sets were sold to retailers per dozen for just 38¢, 80¢, and $1.95, respectively. Also pictured in the above N. Shure Company catalog is a Snow White watering can, overall size 9" x 11". Wholesale price $1.96 per dozen. The artwork shows Snow placing a flower garland on a deer. 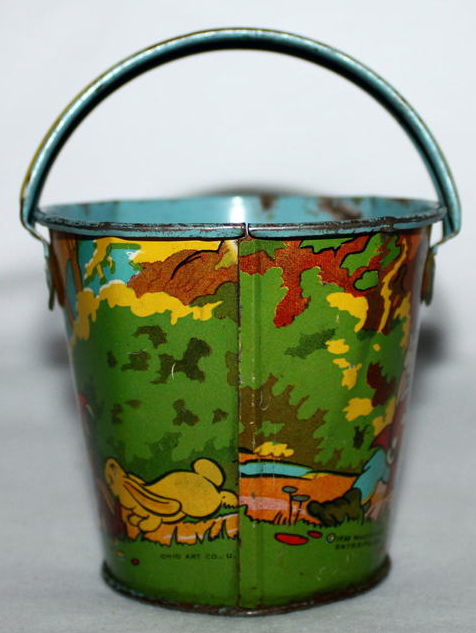 A smaller 6.5" version (below) of the same lithographed can was sold by Hakes in June 2008 for $556.60, and another in July, 2012 for $172.50. 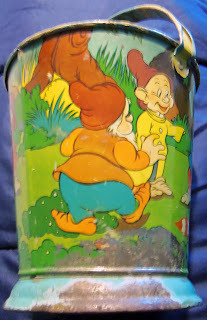 On the opposite side, Doc holds a sprinkling can as the dwarfs wash up. Top and bottom are bordered by bunnies. 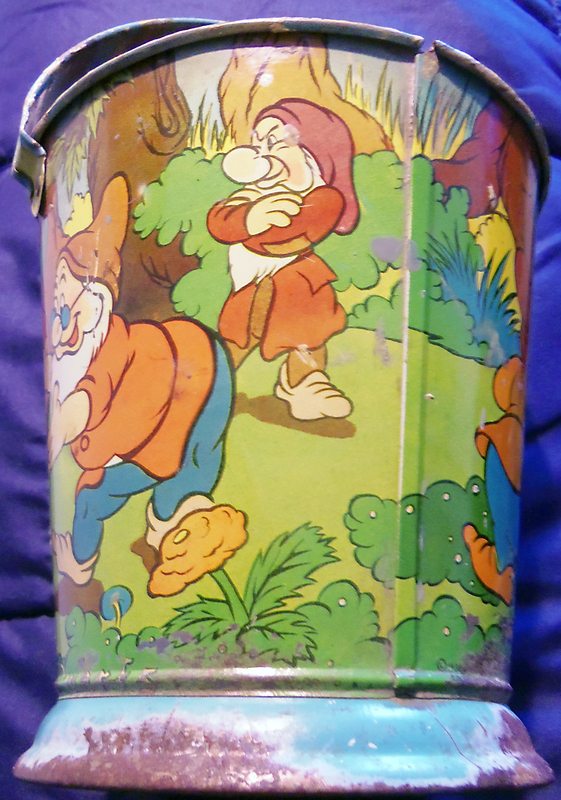 The 6.5" can (listed as 6") is pictures side-by-side with an 8" in The Collector's Encyclopedia of Disneyana, pages 142-143. An Ohio Art "Sand Toys" advertisement appeared on page 78 of the April 1938 issue of Playthings, the premier journal of the toy trade industry. An array of sand toys are seen in Cecil Munsey's 1974 Disneyana book. Image scans via gdawg and the Michael Filippello Collection. 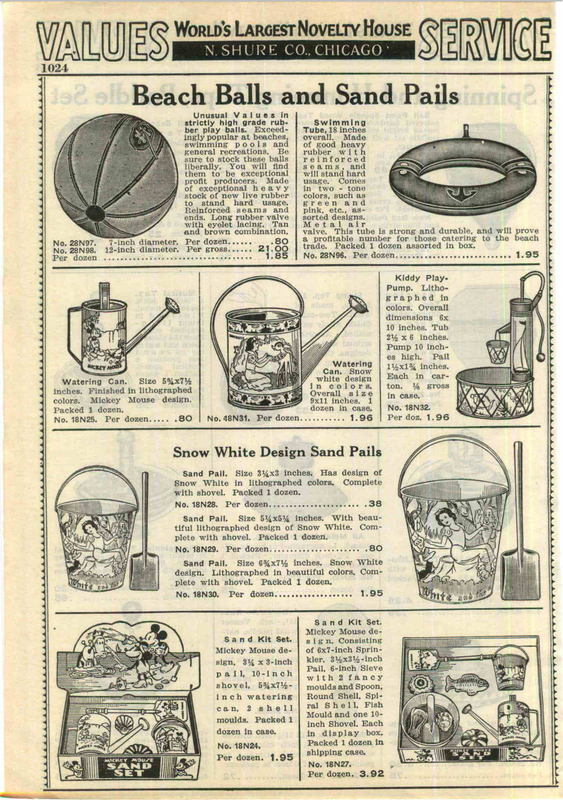 A similar ad from Playthings September 1939. 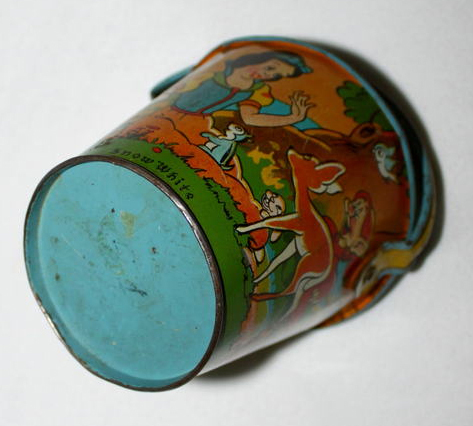 Image courtesy of the William Stillman Collection. The Ohio Art Company was nothing if not prolific when it came to the production of high quality tin toys for Disney. 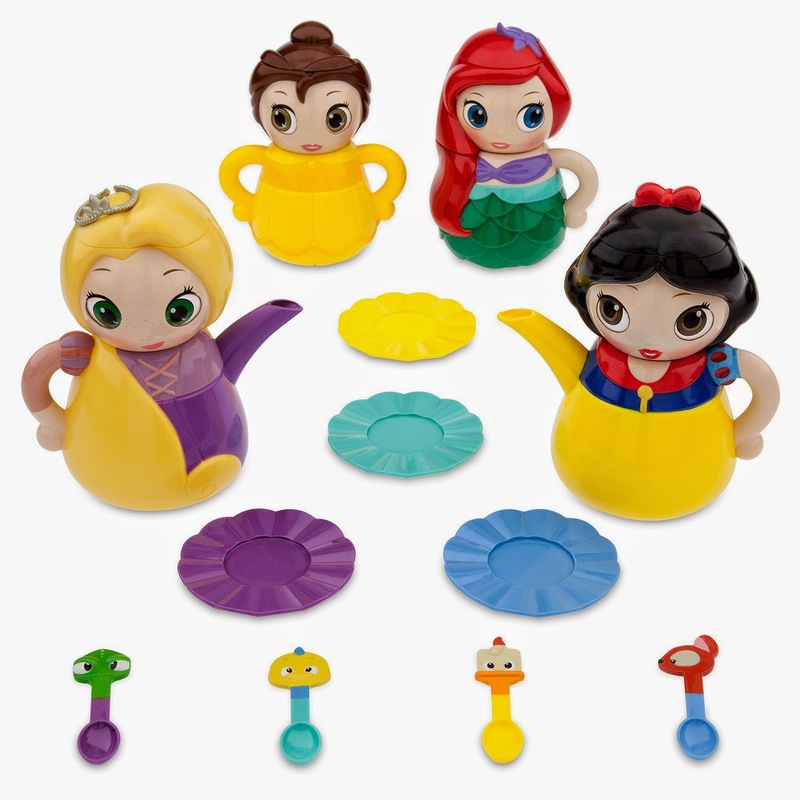 Ariel, Belle, Rapunzel, and Snow White are all featured as components of the 2013 Princess Q-Tea Play Set. 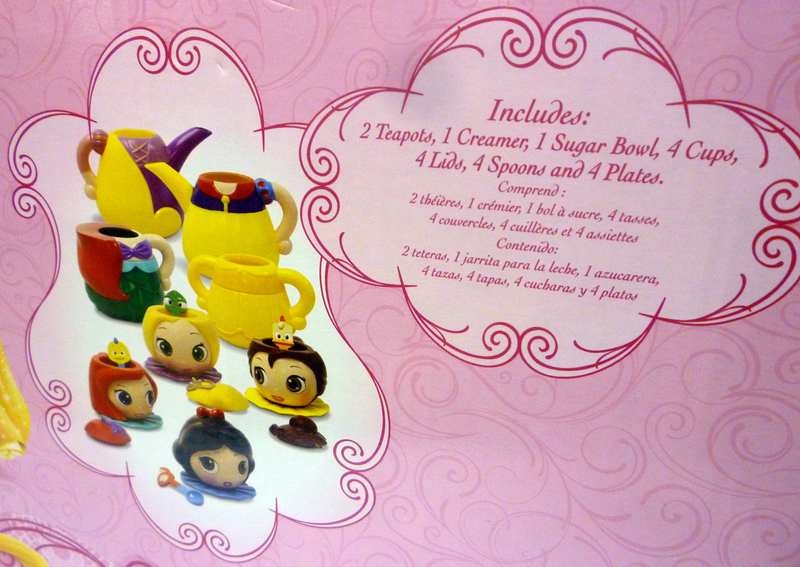 The 20-piece collection includes 2 toy teapots, 1 creamer, 1 sugar bowl, 4 cups, 4 lids, 4 spoons, and 4 plates. 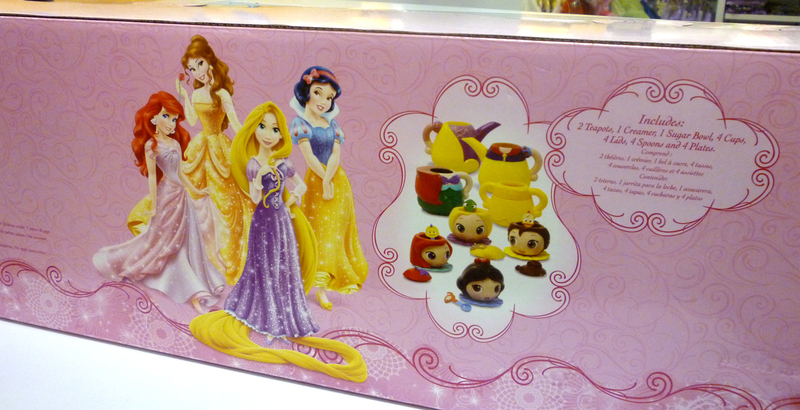 Each princess setting stands approximately 6.5'' high when stacked and assembled. 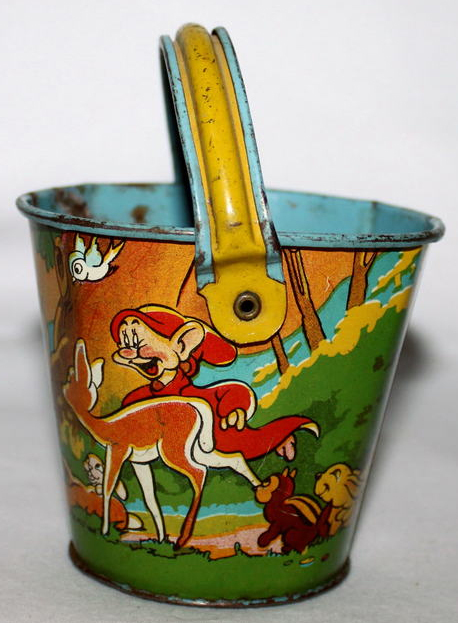 Made of plastic. 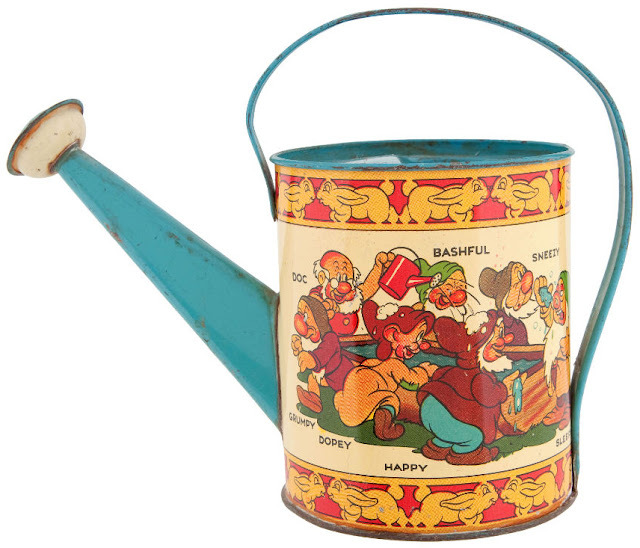 Original retail price $19.95. Here we have a rare gem, an RKO promotional postcard from the initial Italian release of Snow White. Made of cardstock, it's double the size of postcards common in Italy at that time. The crease across the center is original since it would have come folded in two. Unfolded, it measures 14 x 18cm. 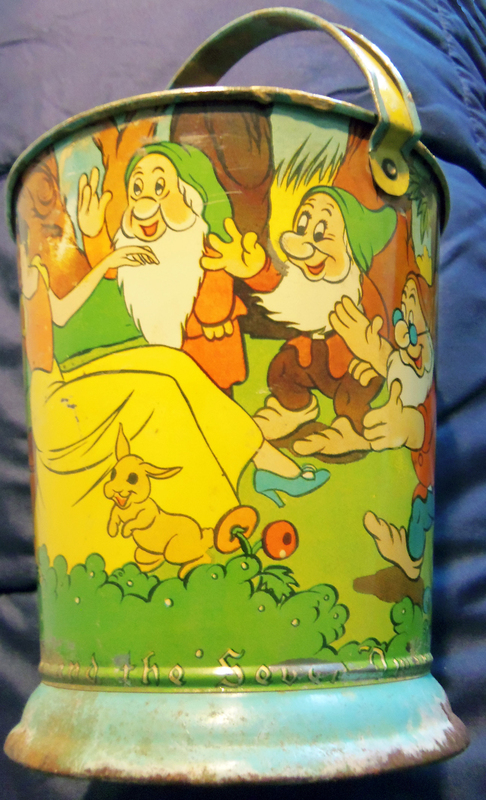 The classic Gustaf Tenggren cast portrait graces the front with the "Snow White" name plate in Italian. Generalcine will present. 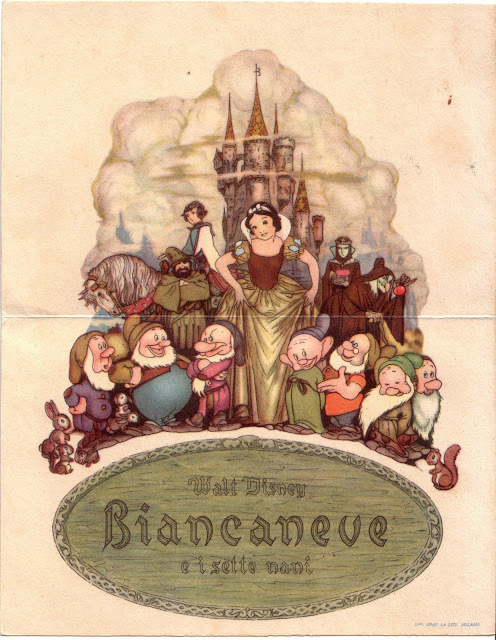 Snow White and the Seven Dwarfs, Walt Disney's first full length motion picture in color. 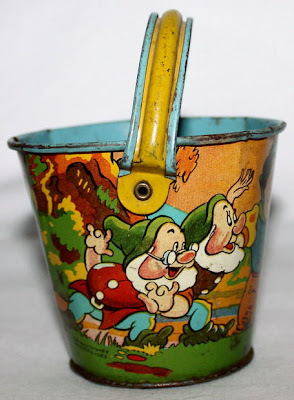 The Wonder of Wonders - Unforgettable for Children and Grown-ups. 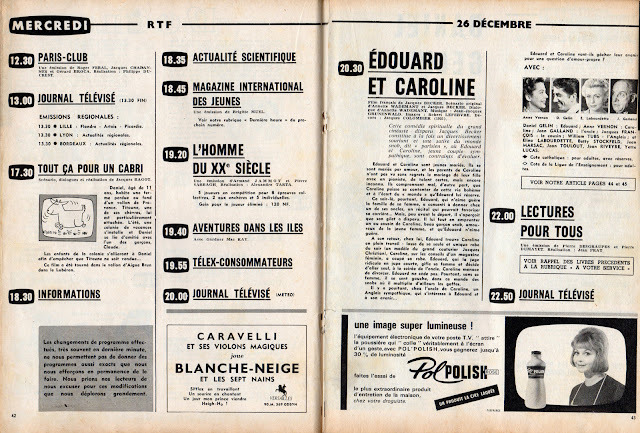 Generalcine was the Italian "host" distributor for all the RKO movies seen in Italian theatres. Their logo is in the upper left, RKO's in the lower right. 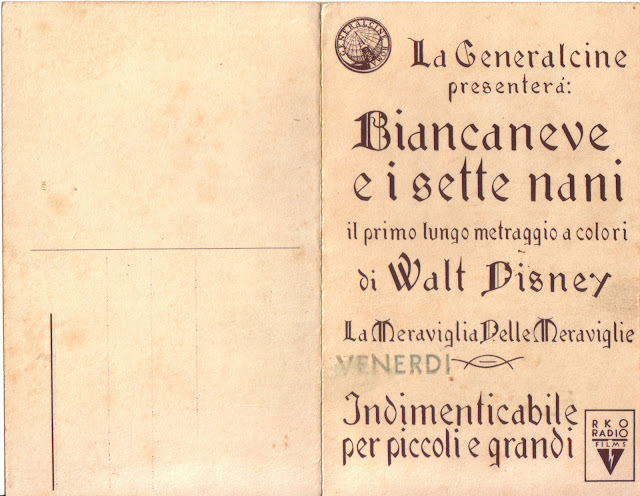 This particular card also has a rubber stamp imprint with the word, "Venerdì" (Friday). The general release of the film occurred in Italy on Thursday December 8, 1938. Yet, some cinemas didn't begin showing it until Friday. Unfortunately, no name is given for the theatre. 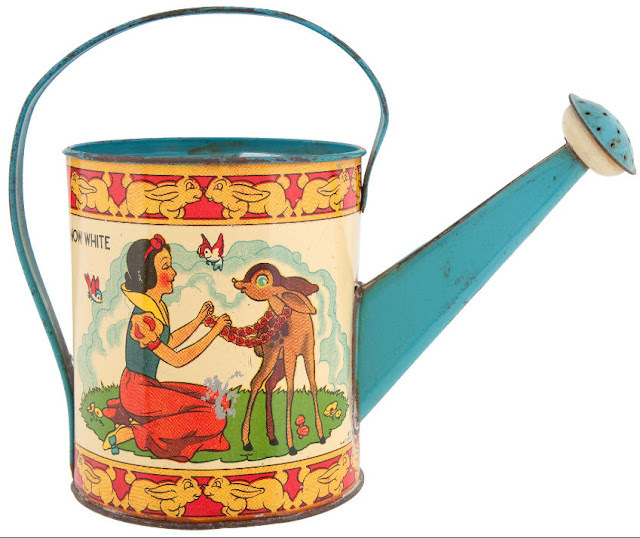 Images and info courtesy of the Nunziante Valoroso Collection. In 1962, only one television network existed in France, the state-operated RTF--Radio-Télédiffusion-Française--yet there were many different TV Guides to choose from. 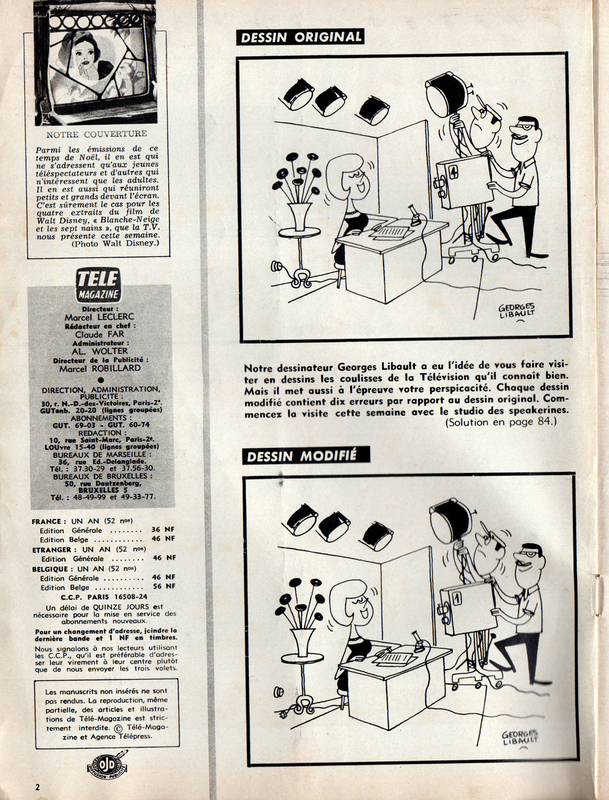 This one is Télé Magazine No. 374 from the week of December 23-29. 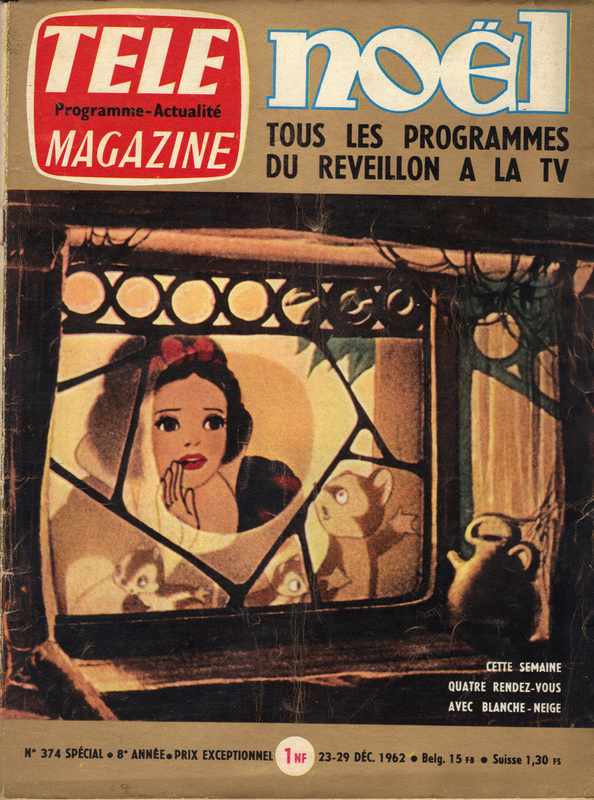 Featured on the cover is an image of Snow White peering through the dwarfs' cottage window. 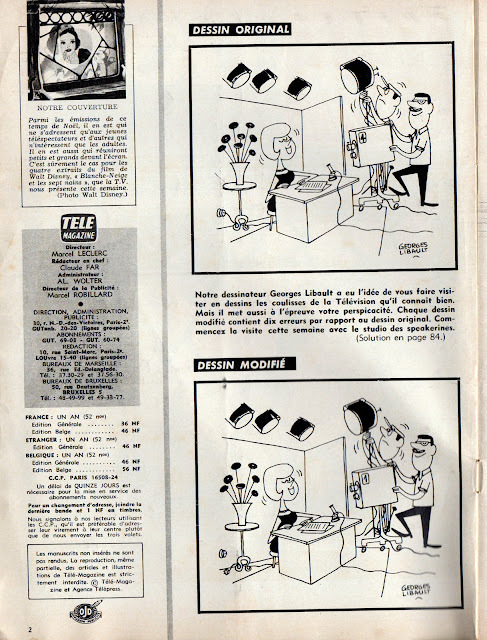 The magazine would have been sold throughout France and along the border in other French-speaking countries where the RTF signal could be picked up. 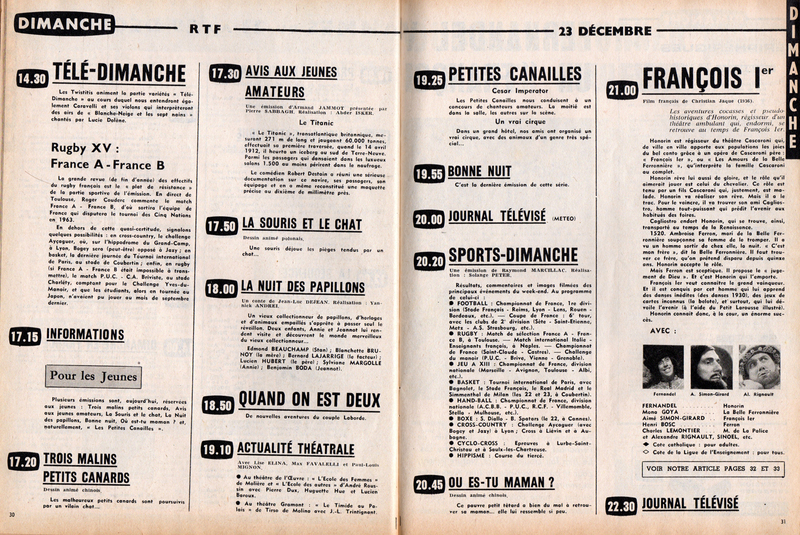 Price: 1 NF (French New Franc), 15 FB (Belgian Franc), 1,30 FS (Swiss Franc). 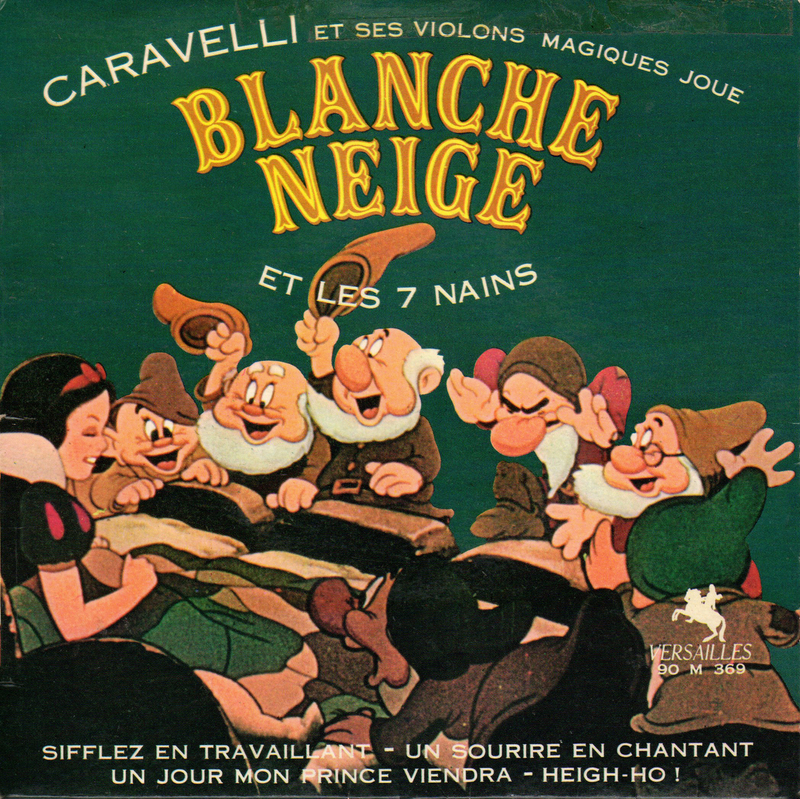 Snow White and the Seven Dwarfs was re-released to French theatres on December 12, 1962. 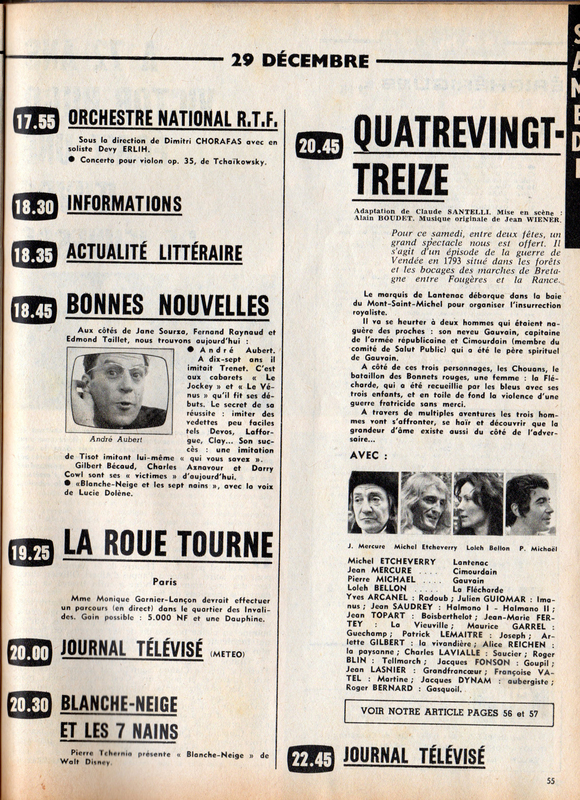 In celebration of its return, several television "specials" were scheduled to air. The small box on page 2 explains what these are, though not in much detail. It only states that some shows are for adults, others for kids and that Snow White should be interesting for both. 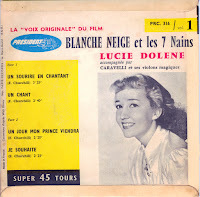 The first Snow White TV event would include Lucie Dolène. 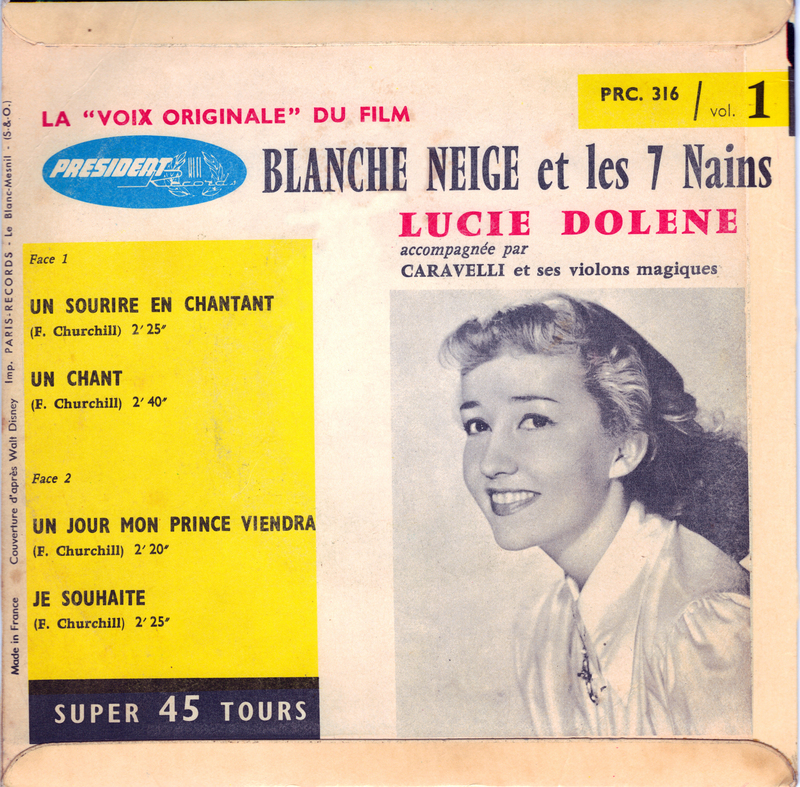 On Sunday the 23rd at 2.30 pm (14:30), during the Télé dimanche show, Lucie would sing her Snow White songs with Caravelli and his violins. 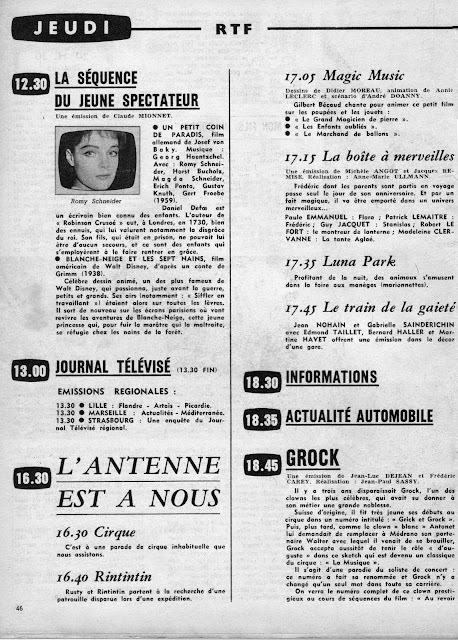 On Thursday (Jeudi), December 27th at 12:30 pm, the La Séquence du Jeune Spectateur (Young Spectator Sequence) show ran short excerpts from Snow White along with clips from the Romy Schneider movie, Un Petit coin de paradis. No more details were given other than an announcement for the return of Blanche-Neige et les Sept Nains to Parisian screens. 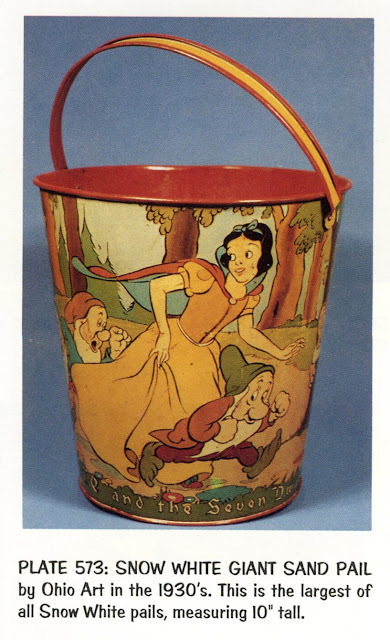 On page 48 is an ad for the adaptation of the Snow White comic strip which was first published in newspapers in America. 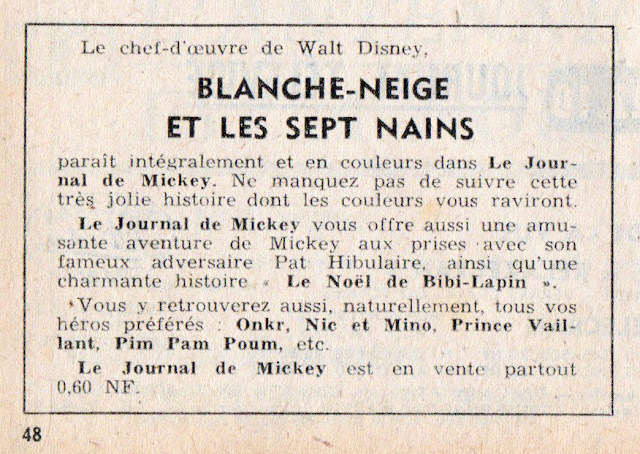 This French version would appear weekly in “Le Journal de Mickey” (Mickey’s Newspaper). Page 55: French TV personality and Snow White enthusiast, Pierre Tchernia, appeared at 8:30 pm for 15 minutes after the evening news. 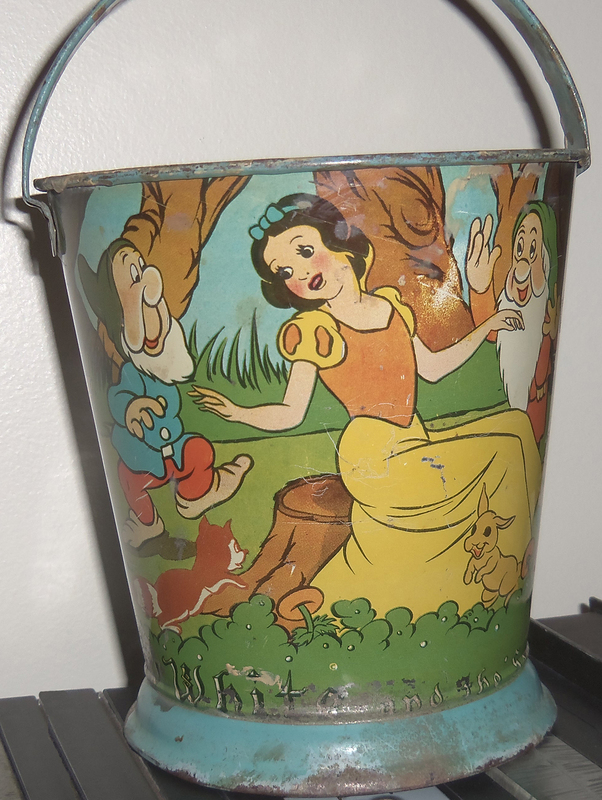 He hosted a Blanche-Neige special where he shared why this was his favorite film. 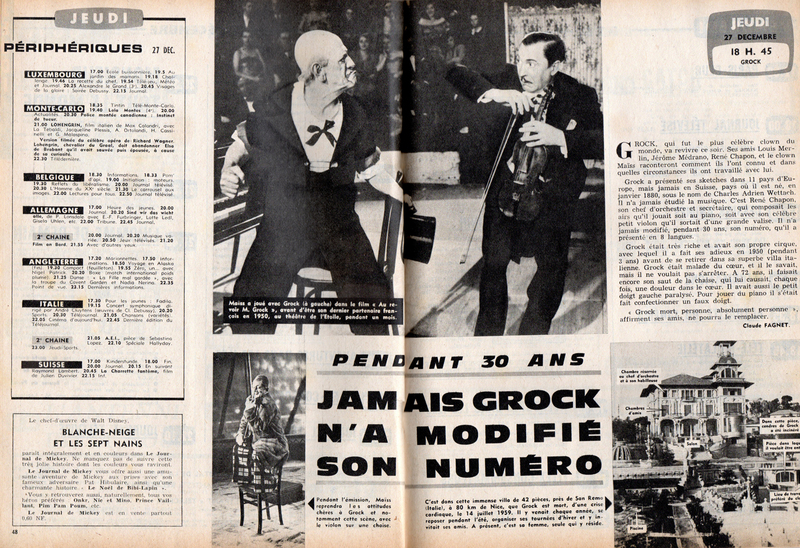 Info and image scans generously supplied by Greg Philip of A Lost Film. 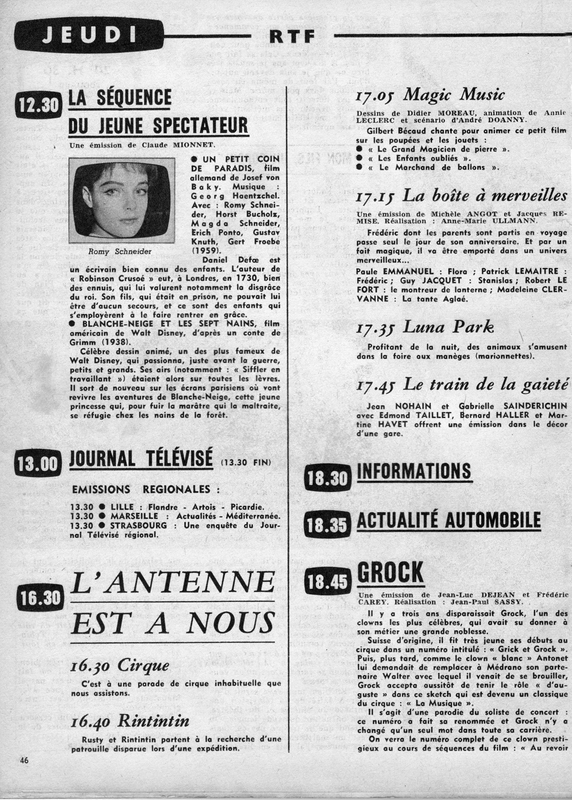 1962 was a big year for Snow White in France; there were probably plenty more sneak peeks at the film on various TV shows. 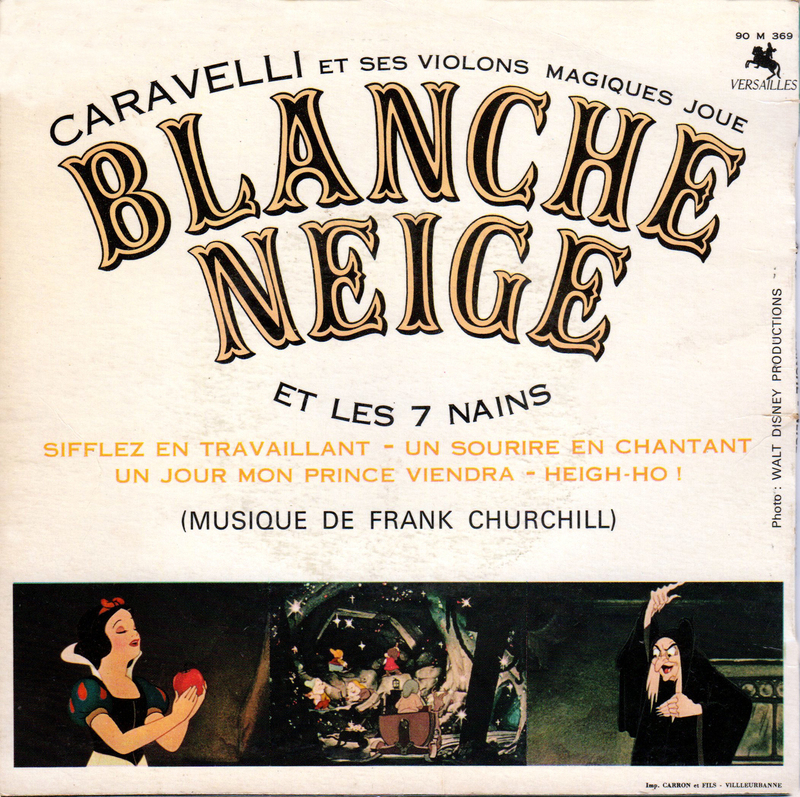 Caravelli, real name Claude Vasori, was born in 1930, and is best known as a French composer and orchestra leader. In 1962, under the Versailles record label, Caravelli and His Magic Violins produced this 45 rpm 7" disc featuring four songs from Snow White.Catalog no. 90 M 369. Image scans courtesy of Greg Philip of A Lost Film. Also visit an earlier post about another 1962 record where Caravelli and his Magic Violins accompany Snow White voice actor Lucie Dolène. 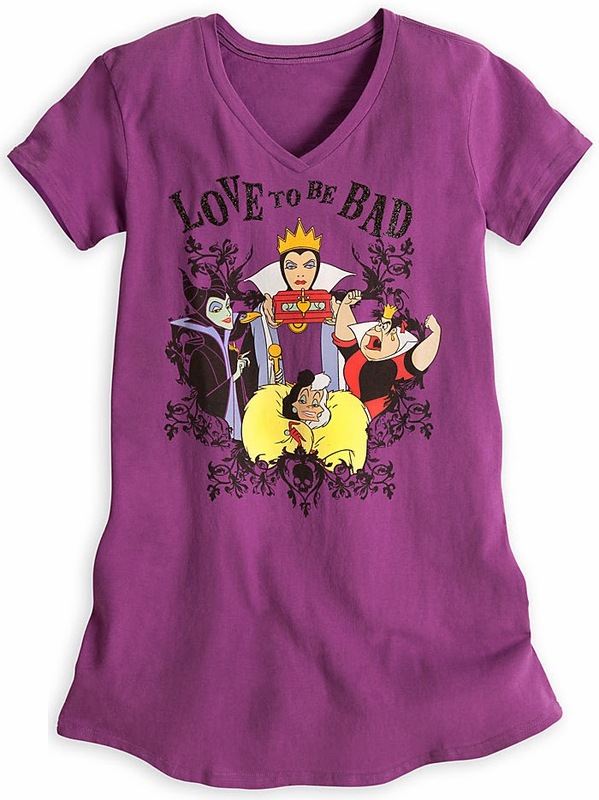 Disney Villains Nightshirt for Women. 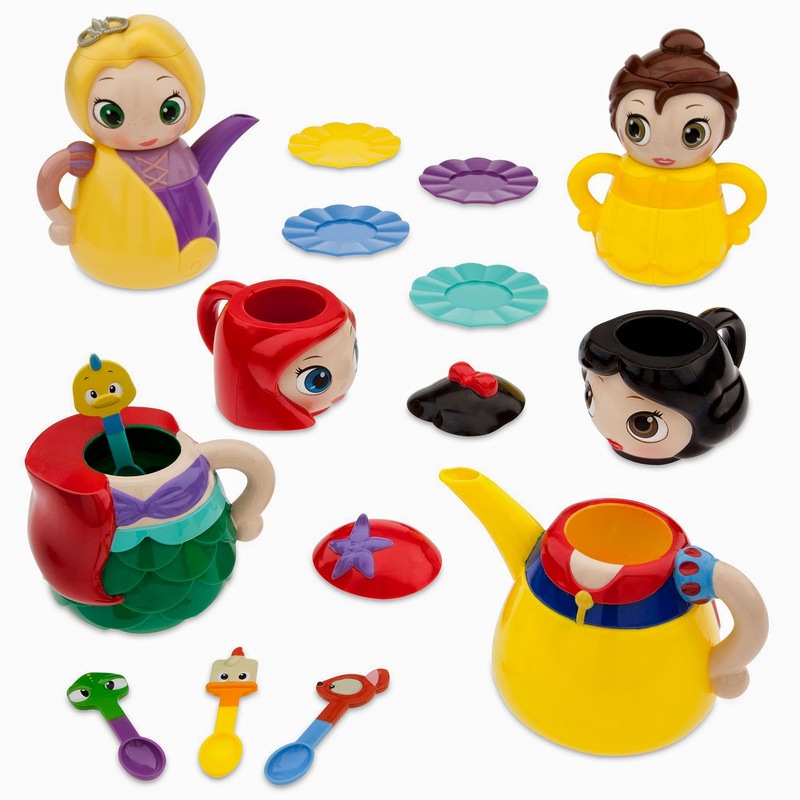 Features the Evil Queen, Maleficent, Cruella De Vil, and the Queen of Hearts. 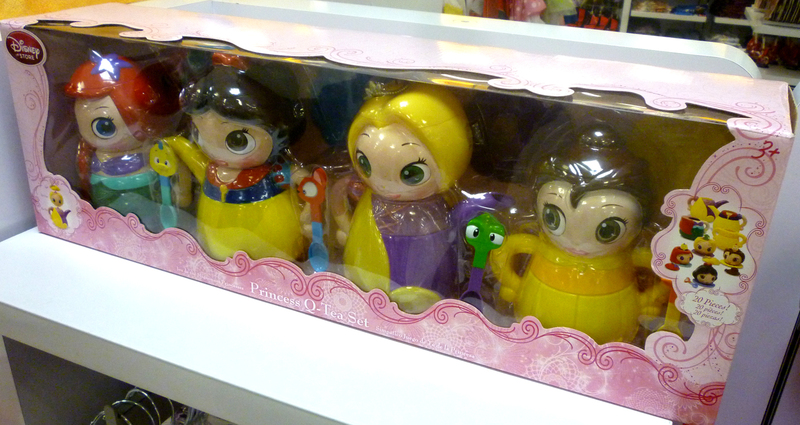 Disney Store, 2013. 100% cotton. Original retail price $16.95. 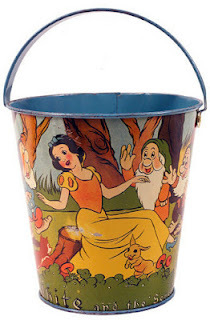 Vintage Snow White "Collector Print Primer Cards"